The actor is best known internationally for his role as Merovingian in Matrix Reloaded and Matrix Revolutions, as well as his part in the historical drama Of Gods and Men. He has starred in over one hundred films, including the recent biographical film, The Odyssey, conveying the life of Jacques-Yves Cousteau, the oceanographic explorer. Lambert Wilson has also appeared on and behind the stage in many plays including Les Caprices de Marianne, the adaptation of the tragedy, Berenice, and the musicals, Le Roi et moi and Candide. As a fervent advocate of the environment, he participated in a reforestation project in Haiti with the United Nations and, more recently, has been engaged with various NGOs for the protection of the Amazon Reef. In the past, he has partnered with FAO and used his fame to promote World Oceans Day, sustainable fisheries management and biodiversity in common oceans (marine areas beyond national jurisdiction). 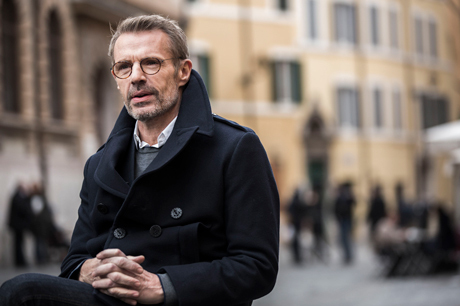 Actor, director, singer, activist, Lambert Wilson is a jack-of-all-trades. Curious and enthusiastic, he gets involved, explores, wonders and seeks to know more. The subjects that are close to his heart are the most universal ones. For him, the Zero Hunger message is obvious. "My meeting with Abbé Pierre, French priest and advocate for the poor, taught me not to be afraid to open my eyes to what seems unpleasant in human life: injustice, poverty, misery. If you have the courage to open your eyes, without looking away, we have already gone far. It's a path that will lead you to action." His commitment comes at a key moment. After several promising years of decline, global hunger figures are on the rise again: 821 million people in the world are suffering from hunger in 2017. Left: We need to invest in science and innovation to improve seeds and make them drought resistant. Right: It is important to find ways to grow more agricultural products with less water. Paradoxically, the world produces enough food for all, yet one in nine people on earth suffers from chronic malnutrition. Conflicts, poverty, depletion of natural resources and climate change partly explain this situation. On the occasion of World Food Day, celebrated every year on October 16, FAO, together with Lambert Wilson, launched a video to encourage all of us, all over the world, to act to fight hunger in the world. The goal is to re-mobilize public opinion not only to fight hunger in the world but also to eradicate it permanently and ensure a sustainable future for all. "We can work together to reverse human negativity and move towards the positive. Let's face up to our responsibilities. Let's act to achieve a Zero Hunger world." Like FAO, Lambert Wilson strongly believes that it is still possible to reach the #ZeroHunger goal by 2030. For this, it is fundamental that we all work together. Governments, farmers, civil society, representatives of private and public sectors, traders, teachers, individuals: everyone has a role to play, on a daily basis. How? By developing policies that support agriculture and rural development and social protection programmes for vulnerable people. And for each of us? Simple actions such as not buying more food than we need, not leaving our fruits and vegetables to rot in our fridges or giving away food that would otherwise be wasted. These are just a few examples. For more information and to get involved, please click here. Here's a behind the scenes look at the making of the video.